"This is my favorite tree. Because even if it is tilted on it's side, it keeps growing". Poignant, beautiful, and utterly astonishing. Writer and director Sean Baker’s (Tangerine) newest film not only showcases some of the finest performances of the year but, is itself one of the very best films to come out of 2017. 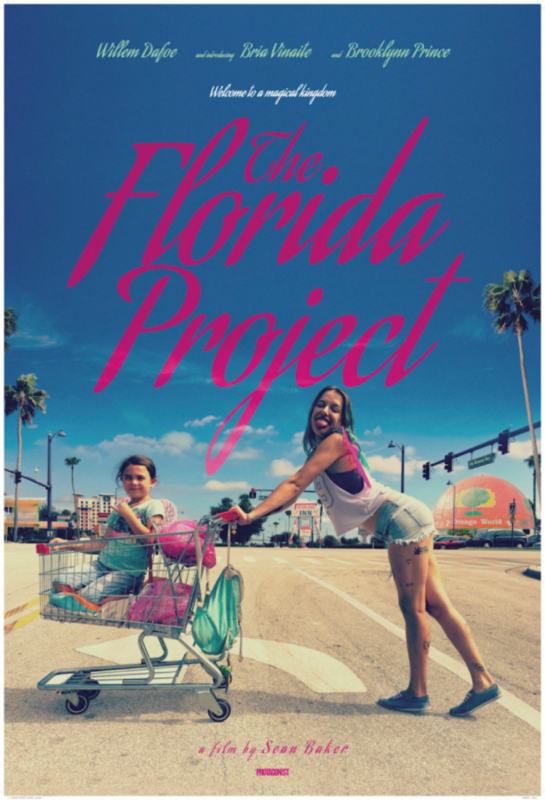 The Florida Project follows a struggling young mother (Bria Vinaite) and her precocious six-year-old daughter (Brooklynn Prince) as they attempt to make ends meet while living in the grisly shadows of one of the happiest places on Earth, Walt Disney World. Sean Baker explores something wholly unique and thought provoking with his latest feature, something that needs more attention brought to it; and that is exploring the population of struggling individuals who are living paycheck to paycheck, willing and able to do anything to keep a roof over their head. More often than not do filmmakers take such risks as to portray and tell a story about controversial topics and situations such as to what The Florida Project perfectly encapsulates. The film never comes off as a forced or preachy attempt to demand sympathy to these struggling and ever-so prevalently flawed and morally confused characters. Nor does it present them in such a negatively and unpleasing light either. Instead, the filmmakers present the viewer with undeniably realistically crafted human characters that are so wondrously captured and fully realized, you cannot help but forget that you are watching actors on screen. Surprisingly enough, the majority of these jaw-dropping performances are brought to life by non-professional actors, some of which have never had any prior acting experience whatsoever. Newcomers Bria Vinaite and Brooklynn Prince in particular, without a doubt, deliver some of the year’s finest performances. Two time Academy Award nominee and world renowned actor, Willem Dafoe (Spider-Man), plays the down-to-Earth hard-working motel manager, Bobby. As with our two female leads, Dafoe’s turn as Bobby is a tour de force performance that most certainly deserves all of the attention and praise it has been receiving (and in my opinion is a for sure lock at the Academy Awards for Best Supporting Actor). None of these euphoric performances would have ever been achieved however, if not for the brilliant direction and mind of Sean Baker, who proves to be one of the very best directors of the year. Baker manages to achieve the near-impossible task of bringing to life some truly mesmerizing children performances. Child actors are always a touchy subject to criticize in film and television as they are naturally still developing and learning about the world around them, and are difficult to cooperate with and direct. However, Baker defies expectations and achieves just that, giving us unprecedented Oscar caliber performances from six-year-old children. From the profound cinematography (all shot on 35 mm film), magnificent directing, and jaw dropping performances, The Florida Project manages to be a monumental achievement technically as well as emotionally with it’s hard hitting themes and messages. There is hardly anything to complain about with the film aside from the controversial and distractingly out-of-place ending (mainly the final 30 seconds or so). While it certainly by no means ruins the viewing experience it is underwhelming and displeasing to see how the film conclude in such fashion. The Florida Project is undeniably one of the best films of the year and minus the flawed ending, the film is magnificent. 4.5 out of 5 stars (9/10).